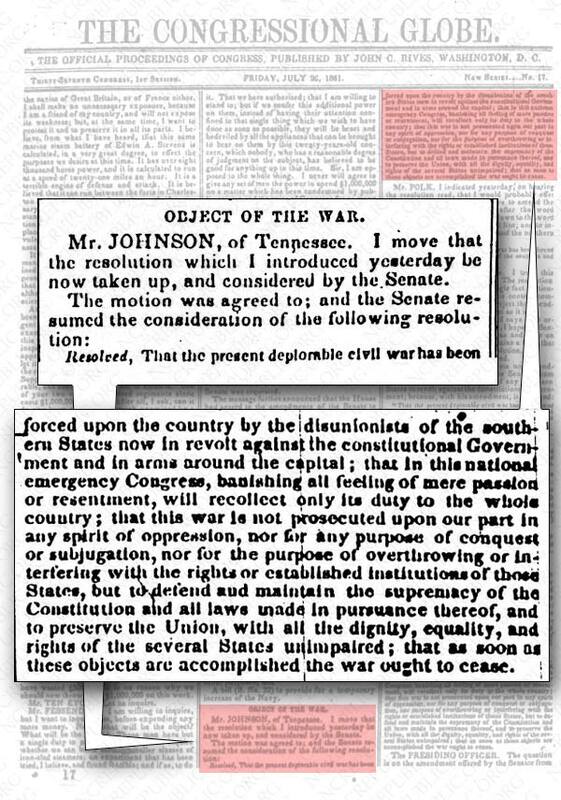 These are the declared objects and purposes of the War made by the 37th Congress July 26, 1861. 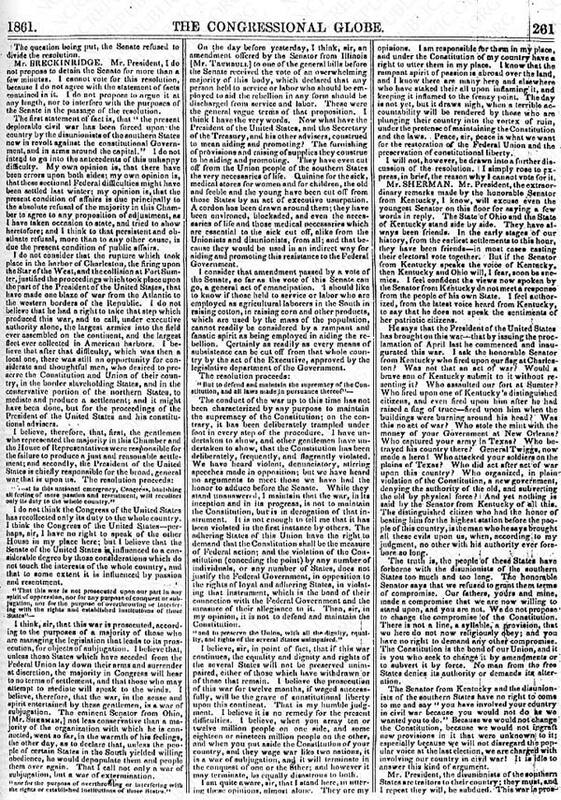 The pages included here show the debate upon the floor of Congress. As you can read for yourself, the original object and purpose of the Civil War was not conquest or subjugation. Take note of those in opposition to the passage of this resolution. Published by John C. Rives, Washington, D.C.
Mr. Johnson, of Tennessee. I move that the resolution which I introduced yesterday be now taken up, and considered by the Senate. 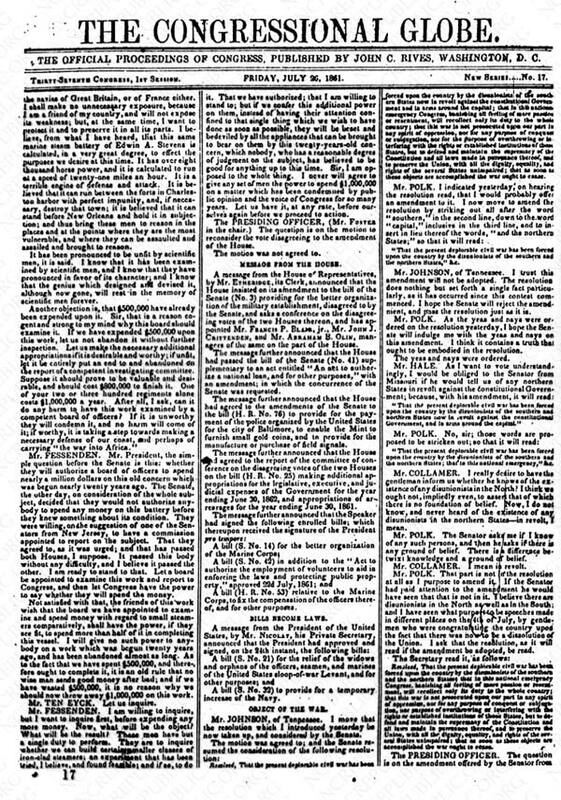 Resolved, That the present deplorable civil war has been forced upon the country by the disunionists of the southern States now in revolt against the constitutional Government and in arms around the capital; that in this national emergency Congress, banishing all feeling of mere passion or resentment, will recollect only its duty to the whole country; that this war is not prosecuted upon our part in any spirit of oppression, nor for any purpose of conquest or subjugation, nor for the purpose of overthowing or interfering with the rights or established institutions of those States, but to defend and maintain the supremacy of the Constitution and all laws made in pursuance thereof, and to preserve the Union, with all the dignity, equality, and rights of the several States unimpaired; that as soon as these objects are accomplished the war ought to cease. I think, sir, that this war is prosecuted, according to the purposes of a majority of those who are managing the legislation that leads to its prosecution, for object of subjugation. 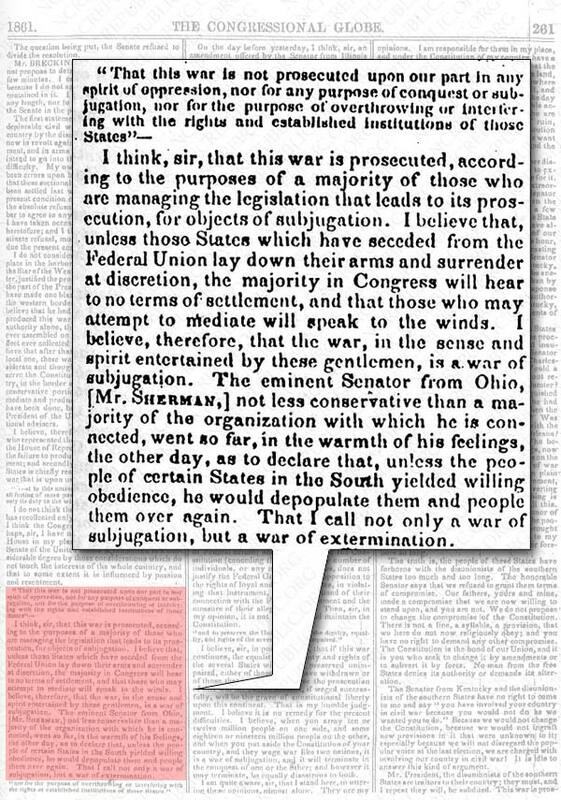 I believe that, unless those States which have seceded from the Federal Union lay down their arms and surrender at discretion, the majority in Congress will hear to no terms of settlement, and that those who may attempt to mediate will speak to the winds. I believe, therefore, that the war, in the sense and spirit entertained by these gentlemen, is a war of subjugation. The eminent Senator from Ohio, [Mr. Sherman,] not less conservative than a majority of the organization with which he is connected, went so far, in the warmth of his feelings, the other day, as to declare that, unless the people of certain States in the South yielded willing obedience, he would depopulate them and people them over again. That I call not only a war of subjugation, but a war of extermination. That as soon as these objects are accomplished the war ought to cease. Click the timeline below and browse to July 1861.